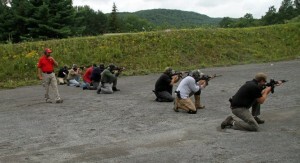 AR-15 Combative Essentials Course - Verdad Investigations & Protection, Inc. This class is designed to give the owner or enthusiast an introduction to their AR-15 style rifle. If you have recently bought or want to know more about your weapon, this will give you sound fundamentals in safety, operation and put you on target. This class has been accelerated to meet the needs of persons who already own and operate an AR-15 platform. Higher speed essential operations and dynamic range exercizes will be the focus of this class. Dynamic Movement off the line of force. This class is not intended to be a “Tactical Class”, all lessons and exercises are geared for the, sport and defensive shooter. These essentials will assist the shooter in moving on to tactical and advanced levels of operation. It is the responsibility of the student to bring the proper ammunition for live fire zeroing in of their rifle/optics (20 rounds min). All ammo must be approved by Range Staff prior to shooting. Ammo may be purchased at the range with prior arrangements with the instructional staff. (standard 55 gr.or 62 gr. FMJ) Student will also need to provide 400-500 rounds of .22 LR ammunition .22 Caliber conversion kits and magazines are provided. This is an 8 hour course. All students must pre-register call (315) 453-3660 speak to Maria.